Boomer Home Gyms: A Health Trend with Benefits. For many people over the age of 50, boomer home gyms have become the option of choice for leading a healthy lifestyle. Setting up a home gym has helped them to create the types of customized fitness routines that lead to healthier, longer lives. 1 Are you “On Trend”? 2 Boomer Home Gyms: The Perfect Fit. 3 Boomer Home Gyms: A Positive Lifestyle Choice that Pays Dividends! The empty nest opportunity: a home gym. 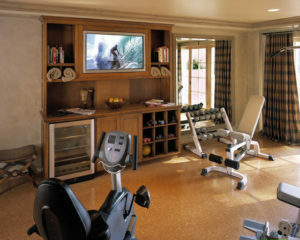 Boomer home gyms are an emerging trend worldwide, as a result of two intersecting developments. The first is the “empty nest” syndrome, as many baby boomers suddenly find that they have more space for setting up a dedicated gym space within their own home. 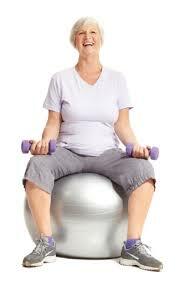 The second is a growing realization by these baby boomers of all the health benefits of exercising past the age of 50. It’s these health benefits that hold the strongest allure for baby boomers. 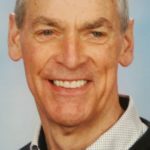 Medical studies have pointed out again and again the importance of fitness for health, wellness and longevity – a message that has always resonated with baby boomers. Boomers want to age actively. Indeed, during the 1980s, baby boomers were at the leading edge of many new fitness trends. What’s different between baby boomers and previous generations, say researchers, is that baby boomers are looking for ways to “age actively” rather than just settling into old age and a long, drawn out period of physical decline. Boomer Home Gyms: The Perfect Fit. That’s where boomer home gyms are able to play such an important role. In many ways, they tap into the cultural values of this baby boomer generation, enabling them to age actively and to transform fitness into a long journey rather than a final destination. Home gyms can be customized for any age. While traditional gyms may be geared to the 18-to-34 demographic, home gyms can be customized for the older baby boomer demographic, which has its own distinct fitness goals that are more focused around health and wellness. That has important implications for how people work out. At a traditional gym, boomers might turn to free weights or barbells for strength and toning, something that can be dangerous for older fitness enthusiasts who are not using the proper form. All in one machines are ideal for the home gym. In contrast, with a home gym, each exercise takes the muscle through a full range of motion and reduces the chance for injury. Moreover, some home gyms, such as those from Bowflex, reduce the need for weight stacks entirely, replacing them with resistance bands known as power rods. And, of course, in addition to the health benefits of creating boomer home gyms, there are also the lifestyle benefits of fitness training. Empty nest boomer couples, for example, can use some of the multi-station, all-in-one home gym machines – such as the Yukon Wolverine Multi-Station or the Bodycraft Galena Pro – to work out at the same time as their partner. The privacy of working out at home frees up baby boomers to exercise on their own terms and to focus more on the health and wellness aspects of working out, rather than training competitively or trying to attain a specific body aesthetic typically sought out by younger individuals. Boomer Home Gyms: A Positive Lifestyle Choice that Pays Dividends! For many boomers, having a home gym gives them a chance to make working out part of their everyday healthy lifestyle. Instead of driving to the local gym, all they have to do is walk down the hallway to their home gym. As a result, in the U.S., women over age 50 now comprise the single fastest-growing group of exercisers, many of them attracted by the lifestyle benefits of a home gym. And that extra fitness training by baby boomers has financial benefits as well. 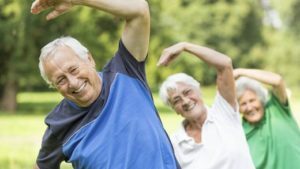 Medical studies have shown that individuals age 50 and over who regularly exercise have shorter hospital stays, lower medical bills, and fewer visits to the doctor than those who do not. Over time, that adds up to a significant cost savings. Medical insurers have noticed, and have encouraged the baby boomer fitness trend. For insurers, it’s a way to reduce the growing health burden of an aging population; for baby boomers, it’s a way to cut their insurance costs and medical bills. Making the choice to start up a home gym is now easier than ever. There are boomer home gyms available at a wide variety of price points, and for a wide variety of exercise skill levels. It’s important to keep in mind that there is no one machine that is perfect for everyone. Instead, there are some home gyms that may be better for beginners who want to slim and tone, and there are others that are better for serious fitness trainers who want to bulk up and gain strength. Moreover, home gyms can differ widely in price. The good news is that most of these all-in-one gym machines are relatively easy to set up, and can be customized for specific fitness routines, including those for cardio, muscle strength and overall toning. Machines from Bowflex rank highly among all-in-one gyms. With these gym machines it’s possible to simplify the home exercise routine – you can literally complete an entire training circuit on a single machine. 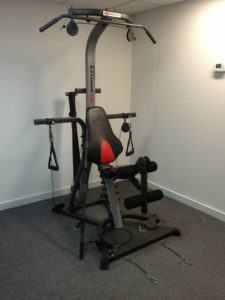 In most cases, the number of exercises possible on an all-in-one home gym machine ranges from 20 to 50, while some of the Bowflex machines provide more than 70 exercises. Depending on age, the type of basic equipment needed to complement an all-in-one gym can differ. Those looking for greater stability and coordination may opt for stability balls, yoga mats and exercises that target the core. Those looking for weight loss may opt for lightweight cardio equipment – even something as simple as a speed rope to get the heart rate up. And those looking to adapt their body for everyday life around them – such as climbing up and down multiple flights of stairs – might focus on equipment to help them exercise their legs and lower body. Given this degree of personalization, it’s easy to see why setting up a boomer home gym has become so popular with fitness enthusiasts over the age of 50. It’s now possible to create a home gym workout routine that’s completely customized to specific fitness needs, as well as one that minimizes the chance for any injury to an aging body. As part of a fitness trend that taps into the changing social, cultural and aesthetic ideals of an aging population, boomer home gyms are helping millions of individuals worldwide boost their health, wellness and overall longevity.